CHICAGO — Even as budgets shrink in newsrooms across the country, it seems the media landscape has become more crowded and vocal than ever. Aggregators aggregate the other aggregators while reporters pile on top of one another at press conferences, hoping their tweet will somehow be the one that breaks through. But in Chicago, aside from a handful of newcomers (yes, us too- sign up for our newsletters), things have been the same for quite awhile. As the big media players stick to the coasts, the options for news here remain fairly limited. 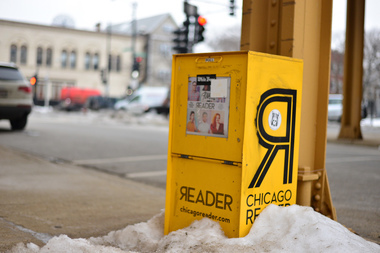 While we try to keep it weird at DNAinfo when we can, the Chicago Reader has been doing just that since 1971 — publishing longreads before they were even called longreads! And now it's in trouble. * The owners at Wrapports LLC have ordered repeated cutbacks that diminish editorial coverage and quality. * The size of the print edition has been slashed nearly 40 percent and popular columns have disappeared. * Other staff reductions have curtailed service to advertisers and impaired distribution of the print edition. * Employees haven’t received a cost-of-living wage increase in nearly a decade. The petition asks fans of the Reader to send a letter to Sun-Times Holdings Chairman and Wrapports investor Bruce Sagan, asking him to give the publication more resources. The Chicago Newspaper Guild, which is promoting the petition, also asked fans to tweet about why they love the Reader using the hashtag #savethechicagoreader. Mr. Sagan, please #savethechicagoreader because I've put 19 years and millions of words into it. They also started a Facebook page for supporters. To sign their petition, click here. To learn more about the whole Wrapports/Reader/Sun-Times relationship, click here.